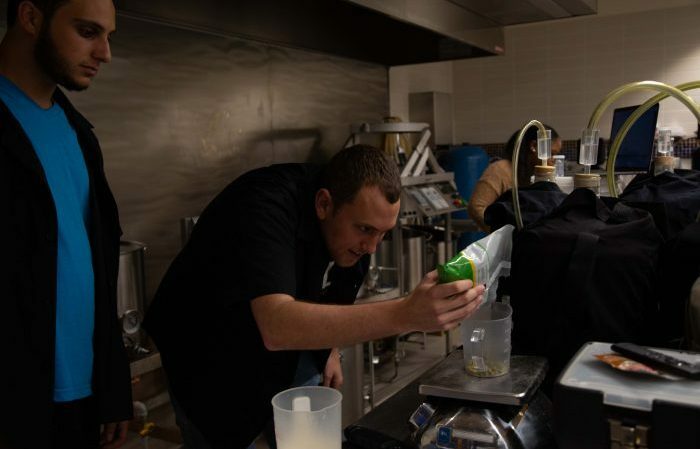 At the Chaplin School’s brewing science lab, students Ethan Gorelick and Michael Lake measure carapils for their brew. If a year ago, someone had told English major Julian Balboa that he would be brewing his own beer and presenting it at a festival, he wouldn’t have believed them. Balboa is part of a group of FIU students, collectively known as Quadrophenia Brewing Co., who will be pouring a beer they envisioned together for guests at the 2018 North Miami Brewfest on Saturday, Nov. 10. 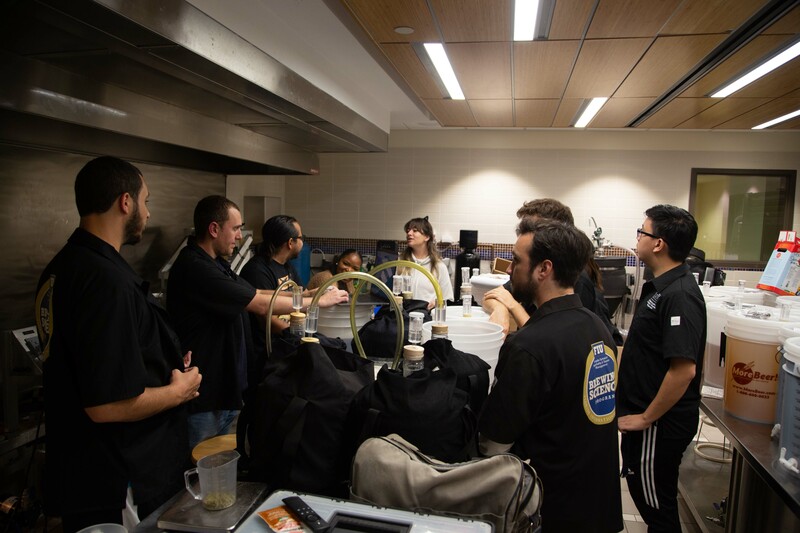 The students met in their Intro to Brewing Science course, taught by professor Barry Gump, a renowned chemist and the Chaplin School’s Eminent Scholar Chair in Beverage Management. They are one of seven groups from the class that will present their brew at the festival; their participation, while optional, was encouraged. The members of Quadrophenia Brewing Co. took their inspiration from British rock. The “company’s” name is a reference to English rock band The Who’s album by the same name. The brew the group created is called “Bittersweet Symphony,” which is the name of a song by Manchester band The Verve. The mango-flavored New England IPA has a balanced sweet and sour taste with a tropical flair. Quadrophenia Brewing Co.’s members include Balboa, five hospitality majors, and two STEM majors. The beer ferments in this vessel for two weeks. The mango-flavored New England IPA has a balanced sweet and sour taste with a tropical flair. “We knew the taste of the mango would pair really nicely with the aroma and hop character of mosaic hops in a hazy IPA,” says group member Michael Lake. The group worked together to craft the recipe; it uses flaked oats and wheat for its hazy tartness and carapils (malt) for a caramel taste. Prior to last year, Balboa never had much of an interest in alcoholic beverages. 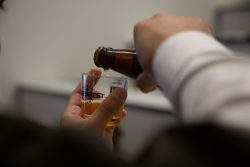 A student in Gump’s class sampling a beer. His newfound admiration for craft beers led him to enroll in the Intro to Brewing Science course as an elective this fall. On the first day of class, he spotted a familiar face. Lake, a beer-tender at J. Wakefield Brewery, which by now Balboa frequently visited, was also taking the class. A hospitality major in its beverage management track, Lake is the most experienced member in the group of seven. He is enthusiastic about the brewing world and has worked in the restaurant industry for several years. He hopes to open his own restaurant after graduation. He says his time at FIU has helped him get much closer to his goal. And that is the uniqueness of the course, which welcomes students of all disciplines eager to understand the chemistry of beer and/or create their own brews with their classmates. 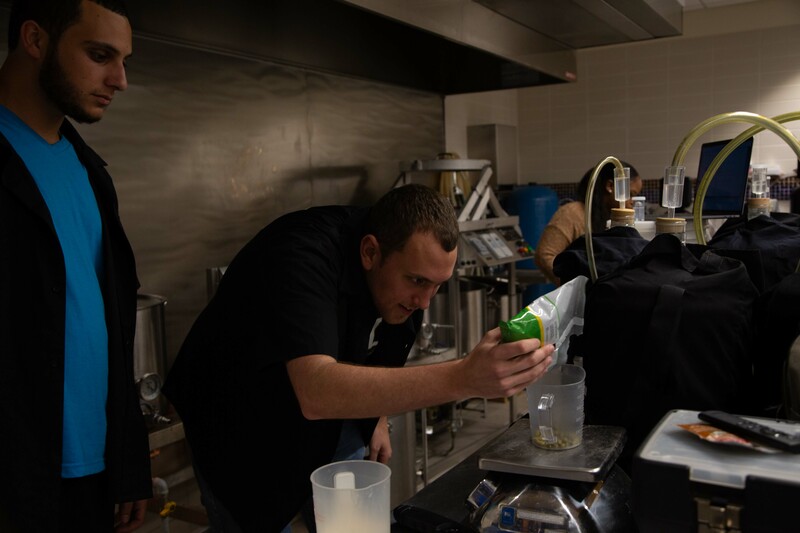 From left to right: Ethan Gorelick, Michael Lake, teaching assistant Albert Rivera, Florance Eloi, Julian Balboa, Given Suman and Hyun Park at the brewing science lab. The group is excited to attend this year’s North Miami Brewfest — started by Gump’s students in 2012 — and share their creation. For Balboa, whose newfound interest in beer has also motivated him to get more involved in the beer industry, this is a chance to form vital connections. 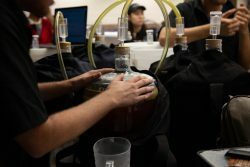 In addition to student brews, this year, North Miami Brewfest will feature seminars on brewing for beginners; how to bake with leftover grains after brewing; and beer’s role in history. The festival also will offer sampling of more than 75 brews from more than 30 breweries, as well as food from local eateries. The festival will be held at MOCA Plaza – 770 NE 125th St, North Miami, FL. Proceeds benefit the FIU Chaplin School of Hospitality and Tourism Management’s brewing science program. Members of the FIU family receive a discount of 10% off their ticket purchase with the code NoMiBrew10. Tickets are available here.